Pointed Squiggle: Will it all be okay? The unfathomable loss of Chris Decker. Will it all be okay? The unfathomable loss of Chris Decker. 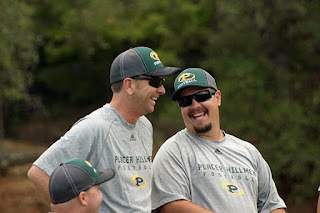 Chris Decker (left) and Chris Ferreria at one of the many PJH games they coached together. In 2013 my son Kyle started playing youth football. He was 10 and in 5th grade at the time. I didn't know much about football but I knew I wanted to get involved so I could know what was going on. I like knowing what's going on. And all of you helicopter parents out there, that is what you need to do! Get involved with what your kids are doing so you can have an insider's look at what's going on! Being the rule follower I am, that first year I did all that was required of me as a parent in a youth sports organization and because of that, not surprisingly probably, I was asked if I would be on the youth football board the following year. As I mentioned, I like to know what's going on! So I said sure, I'll be on the Placer Jr Hillmen (PJH) board. Even though the position I was asked to fill was for the Snack Bar Coordinator and I wasn't sure that was the best fit for me: still I was willing to learn and try to make it work! After a month or so, I was asked to step up to be the Treasurer of PJH. The original treasurer had some personal reasons that were keeping her from truly being able to fulfill the duties of the position. I said yes, sure: Naively thinking that the treasurer position was a better fit for me than the snack bar person. And yes, that was probably true. I'm very detail oriented and I work best by myself. So being alone handling the finances of the organization sounded better to me than running the snack bar on home game days. I can't really do justice in explaining all that's involved in being the treasurer of an organization like PJH. It would be boring to list all the duties and you wouldn't really get it. But in a nutshell, it's a huge job. And being the stress case, overthinking, perfectionist that I am, I worried so much about how to do it. I wanted to do it well and there was so much I didn't know, and that made me even more stressed. That's where Chris Decker comes in. Chris was the president of PJH. He was always so helpful, so supportive, so calming. He trusted me right from the beginning. Even though I was in charge of the many, many thousands of dollars in assets of the organization without really knowing much about what was involved. Being the anxious overthinking worrier that I am, I had tons of questions and concerns. But he wasn't worried. He knew it would all work out. And it did. I always wonder why he trusted me like he did. True, I'd had a background check, but he really didn't know me when I took on the position. Why was he fine with my complete access to all of the organization's financial information? Why was he okay with me stepping into such a huge responsibility for an organization that he was so dedicated to, without really knowing if I was up to it? I don't know. But he was. For two years from that point forward we worked closely together. If you've been involved with this sort of organization, you'll know that there tends to be lots of drama that crops up. There are all kinds of issues that can emerge. The combination of parents and kids and coaches lead to all sorts of conflicts and problems that need to be resolved. As the treasurer, I was on the organization's "executive board" and was privy to much of the drama and conflicts. Chris was so great at diffusing those problems and cutting to the chase of what was really important, what was best for the kids. That was our guiding principle, what was for the best for the kids in the program, and I agreed wholeheartedly with that approach. I saw firsthand how he was able to cut through the drama to that ultimate guideline and was always so impressed with his calm demeanor and laser focus to what was really important regarding the kids. Chris wasn't much older than I am. He ran his own successful business. He was vibrant and active and super dedicated. He was the father of 6 kids. And it was only his middle son, another Kyle, like my Kyle, who was participating in the football program. Chris gave countless hours to make the program successful, when it was only one of his kids who was involved. So many parents have kids in sports and don't give that kind of time, but Chris did. And it's parents like Chris who make youth sports possible. On game days he'd be the first one there at 6:30 am, would stay all day, and would be the last one there at 7:30 pm. If I had a question, or an issue that needed to be resolved, he might give me a smile and a look like "come on, is it really _that_ important?" but he would give me an answer and guide me on what it was that needed to be done. He cared. And not only did he care but he let his actions and his time speak for him and gave so much so that so many kids could have a great experience participating in youth sports. Our community has suffered a huge loss with Chris's death. So has his amazingly strong wife, Nancy, and his beautiful family. Personally, I still can't believe he's gone. How can someone like that, so vibrant, so dedicated, so giving, be gone? It doesn't make any sense at all. But being the overthinking worrier that I am, I can't help but remember Chris's smiles and the looks he would give me when I would stress about all of the silly football financial details: "it will all be okay", he'd convey with that smile. I'm sure that's what he would want us to think right now. I must trust that that is the case. Even though he isn't here anymore and that seems so wrong. Even though we so wish that he were here to make it so. Let's follow in his footsteps and give our time and our calm demeanors and our smiles to make it all okay. Let's do that for him. What a beautiful story. That made my eyes tear up. I have never had the true pleasure of meeting him, but casually knowing his amazing wife Nancy from high school, I know that they have a wonderful family.